There are two critical dynamics occurring today that will impact the way we consume and share content, and the way that content is presented: multi-screen viewing and transmedia storytelling. Both are challenging the entire concept of how we view “channels”, storytelling, and brand/consumer interactions. Here are some insights that help make the point. A May 2012 study conducted by the IAB (Interactive Advertising Bureau) of nearly 2000 US consumers over the age of 18 found that “52% report that it’s somewhat or very likely that they’re using another device while watching television.” That percentage rose to 60% of smartphone users and 65% of tablet owners. So the more screens a person owns the more likely they’re using one or more of those while watching TV. Over a year later, Microsoft conducted a similar study with Ipsos OTX and Flamingo, but broadened the audience to include consumers in Australia, Brazil, Canada and the UK. They found that seven out of 10 use a second device in some capacity while watching television. Both studies found that younger audiences tended to be more comfortable with having more screens open at the same time – e.g. a TV, a smartphone, a tablet, and a laptop. That younger audience represents the future of content access, viewing, and sharing, and there’s every indication that their comfort with multi-screen usage will continue into the future as the cost of devices continues to fall. It’s possible that multi-screen users may give up one or more of these devices in favor of smarter TVs, more advanced 2-in-1s, and even wearables. What is less likely is a reversal of the multi-tasking, multi-viewing behaviors that the multi-screen world has created. As much as people of all ages might like to unplug, the “always on” world will always be calling, texting, or pinging… no matter where you live or how old you are. What will multi-screen usage lead to? In order to succeed in an ‘always-on’ world, marketers need to take a multi-layered approach to content distribution, one that enables portable, personal and interactive engagement across devices. While some companies are still scratching their heads trying to determine what to make of “interactive engagement across devices,” others are turning to transmedia storytelling to make the most of this multi-screen/device trend. While somewhat still on the fringes, transmedia storytelling involves creating a story that is broken into several different elements that are then conveyed across multiple media without losing the intent or meaning of the original narrative. Here’s an example of where this is headed. Let’s say you’re watching a program on TV with your tablet nearby. You use the tablet to look up a character and that information takes you to a side story that gives you access to more insight into the main story. By accessing the side story on your tablet, you’re now prompted to opt-in to receive series updates and those updates are sponsored by a particular advertiser. The latter is probably unable to reach you via your TV viewing because you recorded the show earlier and fast forwarded through the commercials… or you streamed the show from your Internet connection. That particular scenario is not too far off but still somewhat limited by bandwidth constraints and the inability of advertisers and networks to accurately track multi-screen usage. But it should be no surprise that networks and Hollywood have a leg up on transmedia storytelling for now due to their access to content, creators, and budgets to carry this effort further into games, apps and even off-line guerilla events. For instance, the makers of Tron:Legacy created games, apps, and other content prior to and during the run of the movie to help market it and take advantage of the multiple screen viewing habits of their core audience. As technologies continue to advance, it will become less and less expensive to produce content and easier to more accurately measure who’s watching what on which device. Advertisers of varying sizes and with smaller budgets will then have the means to extend a brand’s “story” and products beyond today’s traditional print, broadcast and social channels. Here’s an example of what that looks like today. Chipotle, a U.S.-based fast food chain that prides itself on serving fresh food without the fast food experience, recently created a short video called The Scarecrow to not so subtly knock the competitors who might not be serving up such a fresh experience. At the end of the video, you could download an app for a game that allowed you to earn points for discounts on certain menu items. 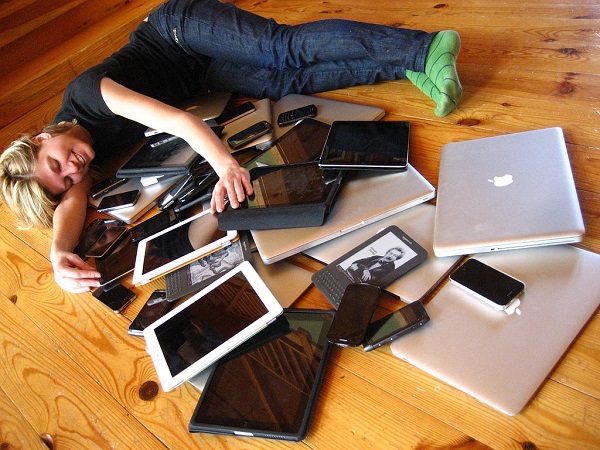 They were reaching consumers via their laptops, their iPhones, and their tablets. This is transmedia storytelling on multiple devices at its simplest… for now. In the future, new devices like Google Glass and multi-function wearables, and advances in augmented reality will present far more variations. An experience with a brand will then become much more immersive, giving the consumer more control over how they interact with a brand and more options to do so. They, not the product, will have the ability to become the “hero” of the brand story. Companies who start figuring out how to make the most of this nascent multi-device/transmedia universe, will be well prepared for a consumer already primed for these types of experiences in the future. Those who don’t could be left still trying to figure out how to work their remote.